Wondering what's going on with the Arlington Memorial Bridge repair project? Some answers were revealed during a tour of a stone yard in Upper Marlboro, Maryland. Arlington Memorial Bridge between D.C. and Virginia is undergoing its first major overhaul since it opened in 1932, and some of its parts have been moved to Maryland to get some special attention. 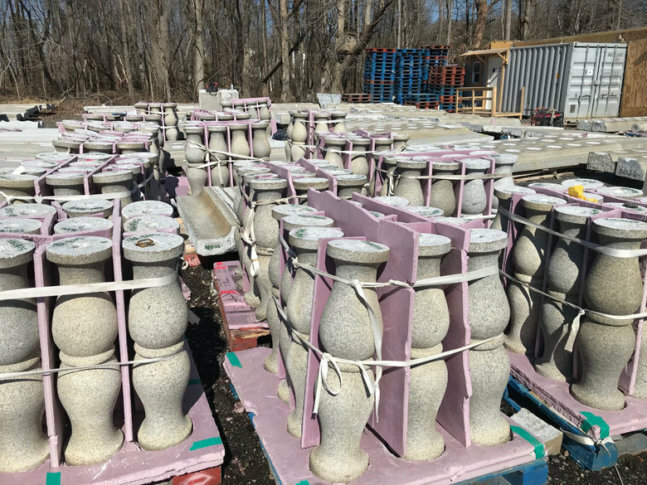 Some 2,320 pieces of stone taken from the bridge’s south elevation are now sitting in a stone yard in Upper Marlboro near Joint Base Andrews. They include curbs and balusters, which are pillars that make up part of the bridge’s railing. Many of the stone pieces are getting pressure washed, and some are getting a deeper clean. “We are doing some localized microabrasion,” Lindy Gulick, an architectural conservator with the National Park Service, said during a tour of the yard. The trick is not to get them too clean. Some stone pieces need to be repaired or replaced. One repair technique called a dutchman involves replacing part of a damaged stone with new stone that fits perfectly. Another technique — a pinning repair — can be used to fuse broken pieces of stone back together. Holes are drilled, metal rods are placed inside, and epoxy is used to hold both halves together. The bridge was built with Mount Airy granite from North Carolina, and if stone needs replacing, Gulick said the same granite is being used. The bridge rehab project remains on schedule, with a new construction phase set to start this fall and final completion expected in 2021.